At approximately 8am on Tuesday, July 25 2017, a group of protesters blocked a road leading to Preston New Road fracking site near Blackpool, bringing a convoy of seven lorries to a halt. At this point, four men quickly hopped on top of the hoods of the lorries and remained there for three days and nights. Standing on the hoods of the lorries Simon Roscoe Blevins, 26, Richard Roberts, 36, Richard Loizou, 31, and Julian Brock, 47, waved flags that read ‘#rolling resistance’ and were given warm clothes, food and drinks throughout the days by locals and fellow activists. More than a year later, the men, who have been convicted for causing a public nuisance by a jury at Preston Crown Court in August were sentenced on Wednesday, September 26, for their direct action protest. Blevins and Roberts have been given 16 months in prison and Loizou a 15-month sentence. Brock has been given a 12-month suspended sentence after he pleaded guilty. A barrister representing one of the men told the Court that they “would become the first environmental activists to receive jail sentences for staging a protest in the UK since the mass trespass on Kinder Scout in the Peak District in 1932” as reported by The Guardian. 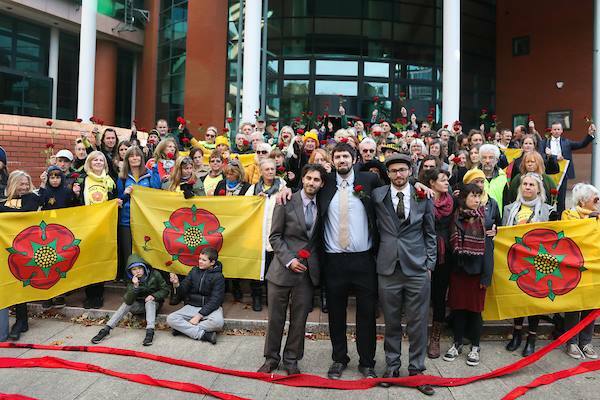 As the three prepare for their prison sentence, it’s time we ask ourselves what they are being punished for and whether these are the kind of legal concerns we rightfully wish to stand behind: damage to Cuadrilla or damage to our planet and our health.